With no specific objective, for years I have been collecting beads, buttons, shells, and other small, shiny, and beautiful objects. They spoke to me as individual things. At some point they became a chorus. Transforming them into wearable beadwork has been challenging, stimulating, and satisfying. My process employs an old Native American stitch called peyote. It is hand held, requiring nothing more than needle, thread, and beads. 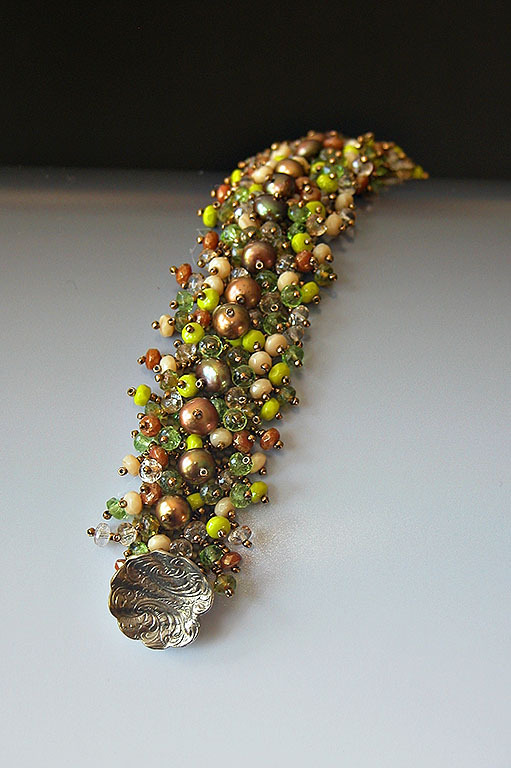 A section of peyote stitch creates a flexible foundation for me to embellish with faceted gemstones, vintage elements, or natural materials such as shells and pearls. The piece is complete when it is simple and complex, peaceful and exciting, classic but new. As the wearer moves, the beadwork moves, catching the light.